An introduction to Tom DeMark Indicators written by Jeffrey Tennant, Author of "The Mejt System". Examples of Tom DeMark Sequential and Combo Indicators. In the late 1970s Tom DeMark devised some technical indicators which he called the TD sequential and TD combo. These indicators successfully showed the areas in which the market was sufficiently oversold for one to expect a bottom to form. Demark used the same rules, applied in reverse, to indicate the area of a potential market top. I hope that a few examples will clarify the concepts. See examples of the Sequential and Combo Indicators. Return to part one to read more about the Sequential and Combo Indicators. Fig. 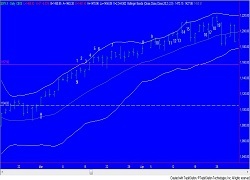 DM1 shows a sequential buy signal at the OCT 2011 low. Nine bars of a buy set-up printed. 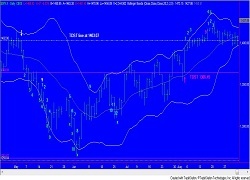 The TDST line represented the true range of bar 1 of set-up rather than the trend high. The stretched out look of set-up was ideal. The close of either bar 8 or bar 9 qualified the set-up as perfect. Note the white color. Thirteen bars of countdown then printed, which are colored in blue. Note especially that anyone who went long after the signal was given at bar 13 would have had to sit through a sickening decline before being rewarded. In this chart, you will see that the previous bar to the actual Oct low closed lower and may ask why did it not trigger a stop? The stop loss is based on the lowest bar of the pattern and as we can see, this was the day after bar 1 of countdown in August. However, using DeMark's rules, the decline in October did not fall low enough to trigger the stop loss. The chart also features a sell set-up. One should expect resistance at the TDST line. Overcoming that resistance typically leads to higher prices. Fig. DM2 shows the 9 bars of a sell set-up. Thirteen bars of countdown printed, but the market continued higher. The standard rule says that when 18 bars of countdown have printed, the pattern has failed. (And when sequential patterns fail, they fail big.) However, a friend of DeMark’s, who told me I could publish this information, says that DeMark has found 22 bars of countdown (and not 18) that are necessary to say the signal failed. The stop loss based on price was violated, but by less than 1%; the rules state that the stop is to be interpreted loosely. Fig. DM3 showed that those people with patience were rewarded. Fig. DM 4 shows a series of DeMark sell signals which failed. Note in November that bar 8 of countdown was less than bar 5 of countdown (blue numbers). We can also see in January that the 9 bars of set-up (yellow) were not stretched out. There is a higher risk of failure when either of these conditions are present. However, a failure is not guaranteed and the signals still work a decent percentage of the time. 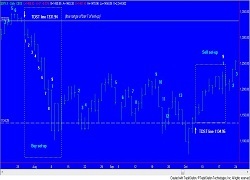 Fig.DM5 shows combo (green) and sequential (blue) buy signals at the mid-year 2012 bottom. Each “x” means that the bar did not obey all the rules exactly, which is allowed. This illustrates the principle that the rules for countdown are flexible, while those for set-up are not. Fig.DM6 is a monthly chart. The rules were developed for daily bars, but they also work for bars of other durations. The longer the duration of the bar, the more valid the signal. I have found bars as small as 15 minutes to be useful. Bars smaller than that have too many failures when considered by themselves. However, when a DeMark signal on a larger time frame is given, looking for sequential or combo signals on bars as small as one minute can help fine tune one’s entry. The chart shows a combo sell signal in green. Failure to undercut the TDST line showed the bulls were not done. 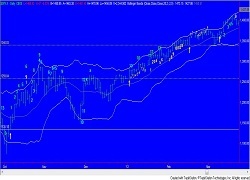 At the chart’s end there is a sequential sell signal in blue which remains active. 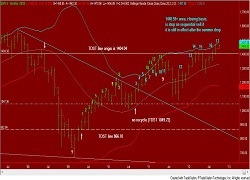 There is resistance at a TDST line from 2008; it extends to one bar past the line. 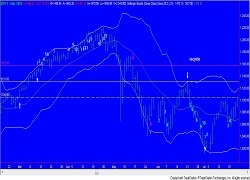 Visit my blog to view my daily technical analysis market updates using the Mejt System and DeMark's technical indicators.